The dependable ones. Fried rice. Spaghetti. Enchiladas. Anything stir fried. Those are the meals that never fail to please in our house, and can be prepared with odds and ends from the pantry and fridge. All of these are based on rice , pasta, or tortillas. I can't imagine life without tortillas. They're so useful--ready to be used in many different ways. I always say that you can wrap almost anything in a tortilla and it will taste great. Well, maybe not Jello. Yesterday, I looked into the fridge and saw a smidge of this and that--a little cooked chicken, a quarter of yellow sweet pepper, a chunk of cabbage, and a package of corn tortillas. I knew that it was tostada time. The best thing about tostadas is the way they taste. The second best thing is that you put all the ingredients in bowls and let people assemble them the way they like. So everyone is happy. These weren't fancy, but they were enormously satisfying. I made a slaw with the cabbage, bell pepper, and cilantro, dressed with a cumin vinaigrette. It added a delicious tang to the tostadas. Of course, you can skip frying the tortillas and turn this into soft tacos. Heat the tortillas in the oven and let everyone make their own tacos. I think that tostadas should be made with small tortillas, so you can pick them up easily and convey them to your mouth. So many of them now are huge things, that are only edible with a fork and knife. Your choice. Whatever size you choose, they will be great fun to eat. These tortillas are a bit smaller than normal. 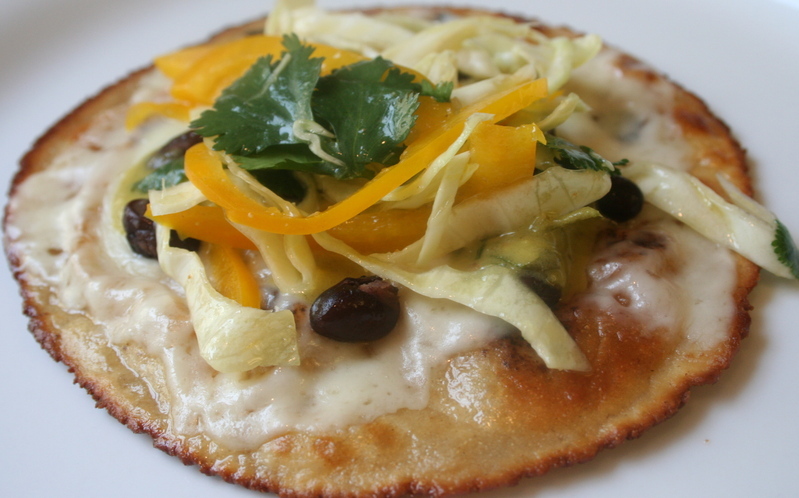 One of my favorite ways to fix a tostada is to put thin slices of jack cheese on a freshly cooked tortilla, and top with a few beans and the slaw. 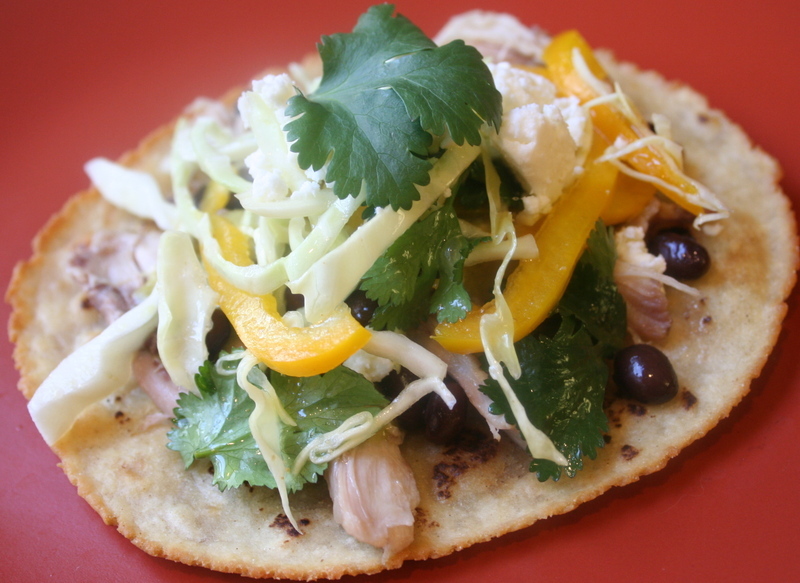 To cook a tostada, simply heat some oil in a skillet until it's very hot. 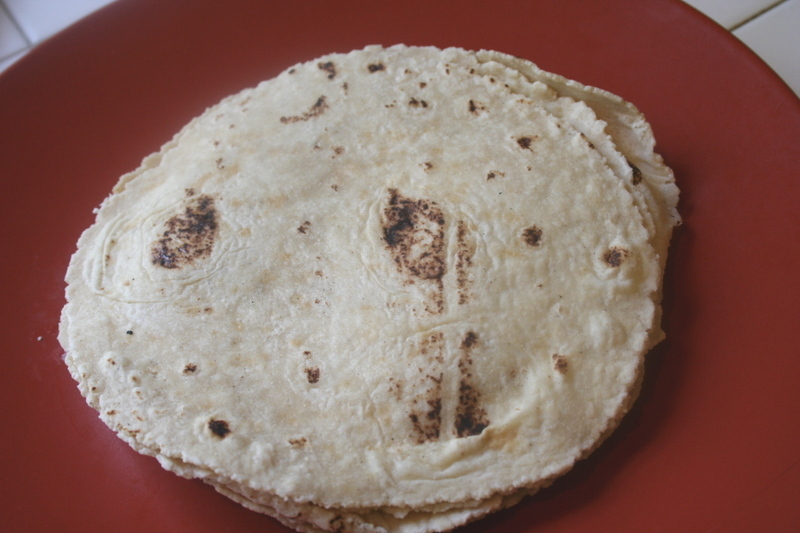 Cook the tortillas, one at a time for a minute on both sides, or until they have colored some and are crispy. Set on paper towels and put them in a warm oven as you cook as many tortillas as you want to eat. Set out the bowls of meat beans, salsa, cheese, lettuce or slaw, etc. Then take the tortillas out of the warm oven and let people have at it. They are great party food. And what child doesn't love them? Combine the lime juice, oil and cumin in a bowl and whisk until combined. Add salt and pepper to taste. Toss the cabbage, pepper, and cilantro in the dressing. I am with you on this. The old standbys which when placed in the mouth produce such a feeling of pleasure and relief. Those torillas look beautiful too. I love tostadas and these look grand. So easy and you can usually use some leftovers in them. I haven't used the cabbage and must give that a tri. Beautiful! Mr. CC would love these! Right on, they will be on my party table next time! Great idea Sher! And hey, wonderful shot, esp the first one, superb lighting and depth of field! Tostadas, crostini, phyllo cups, whateva- I love it all! But tostadas or even soft tacos, I must admit, are especially nice. You just can't go wrong. Of course, cilantro is always a winner in my book. Wrap a tortilla around anything and it's comfort food with the addition of portability. Love the cumin and cilantro in the slaw. I want to have another mexican fiesta as soon as possible so I can try it out. I love the look of your tortillas -- do you make your own? I know that's on my "to do" list for this year. What a great quick and easy dinner idea, too. I'll have to remember this -- yum! Sher, this looks delicious, delicious, delicious!! I've never had tortillas, but I've been keeping a recipe for a while now. I'll make them and use your filling recipe. I don't think I've ever had a tostado (shocking, I know, considering the vast amount of different foods I actually consume ;) ), but this looks like something I could try, since the fillings can be individualized. Mmmm... I'm hungry now. My kids would eat it, anyway, I bet. Sher, this is so yummy! I really love anything with wrap like this. Oh my, hungry now. That looks wonderful and I have a stack in my fridge too. You make so many quick, fresh, wonderful looking meals with them, and I noticed a gal at work who makes a lot of soft tacos out of leftovers like regular old pot roast and carrots or leftover chili or whatever. I like the idea. What a great stand-by. Yum, yum, yum!